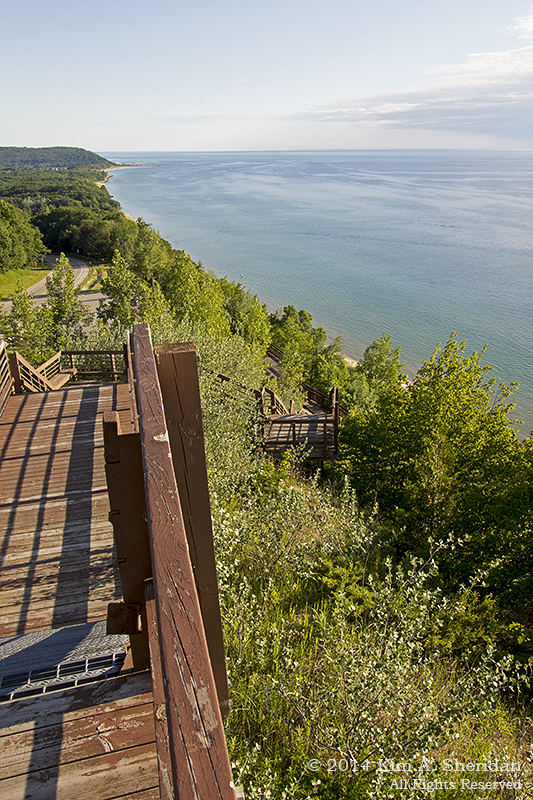 Up North: more than a location, it’s a distinctly Michigan state of mind. At once relaxed and adventurous, and in tune with the natural beauty of the land. No time in Michigan would be complete without a road trip to Sleeping Bear Dunes National Lakeshore, the beating heart of Up North. This year, however, I expanded my northern Michigan horizons beyond Sleeping Bear. I traveled the scenic byway of M-22 from Manistee to Leland, covering 76 miles of its 116-mile length. 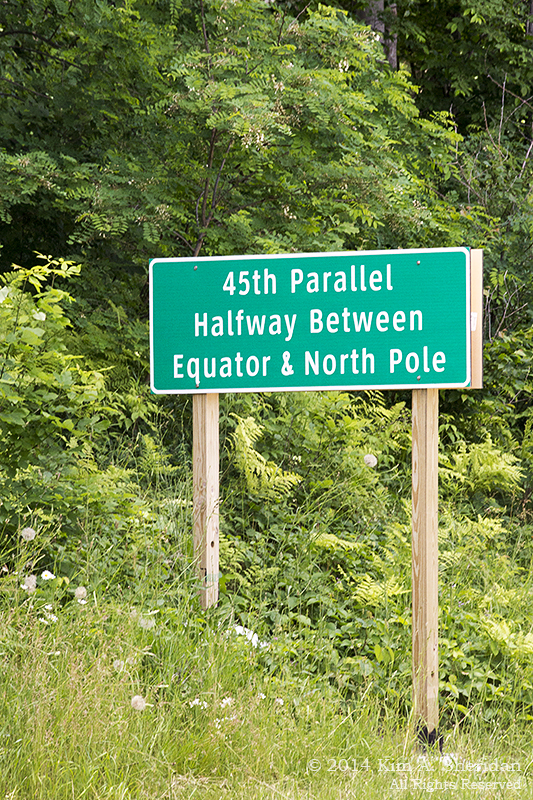 Just south of Leland, I crossed the 45th parallel, which I can say without doubt is the farthest north I have ever been. 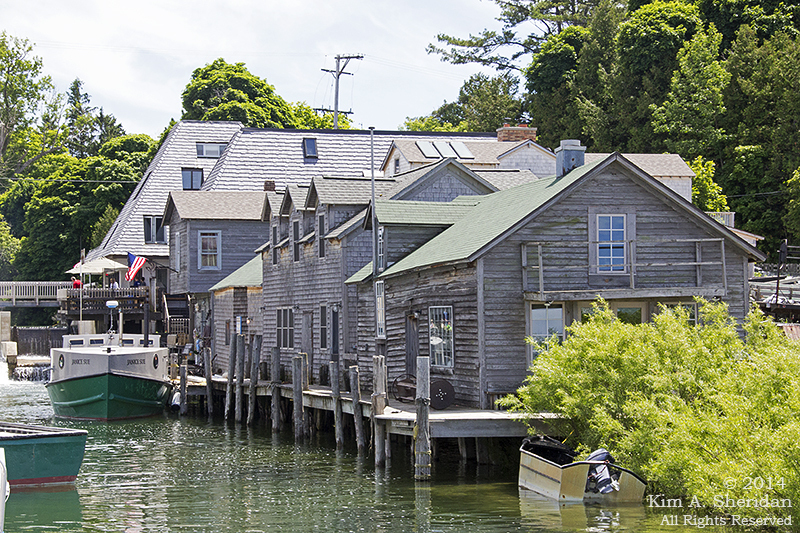 Along the mouth of the Leland River lies Fishtown, a collection of preserved rustic fishing shanties. Most now house quaint shops, but Fishtown remains an active working waterfront. The weathered walls of these shanties have withstood many years of Michigan’s brutally harsh winters, and they wear their tenacity proudly. 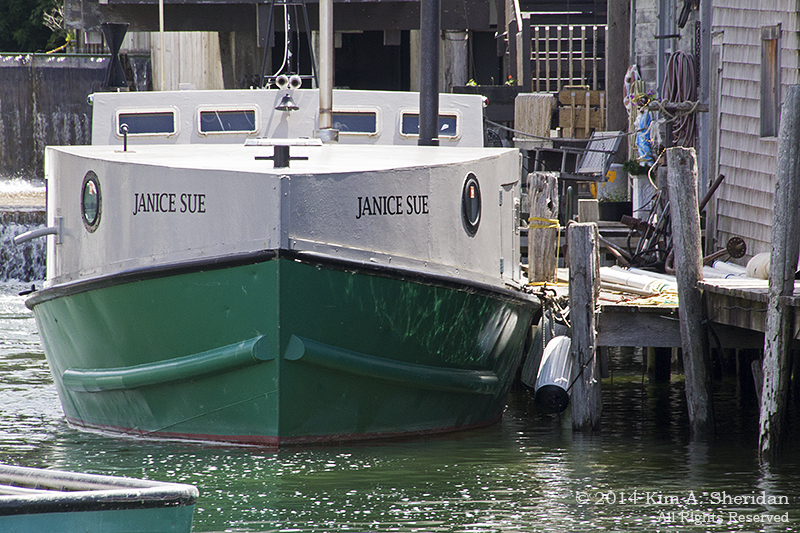 The Janice Sue is one of two vintage fish tugs still actively working among more modern vessels, while serving as a symbol of the village’s fishing heritage. 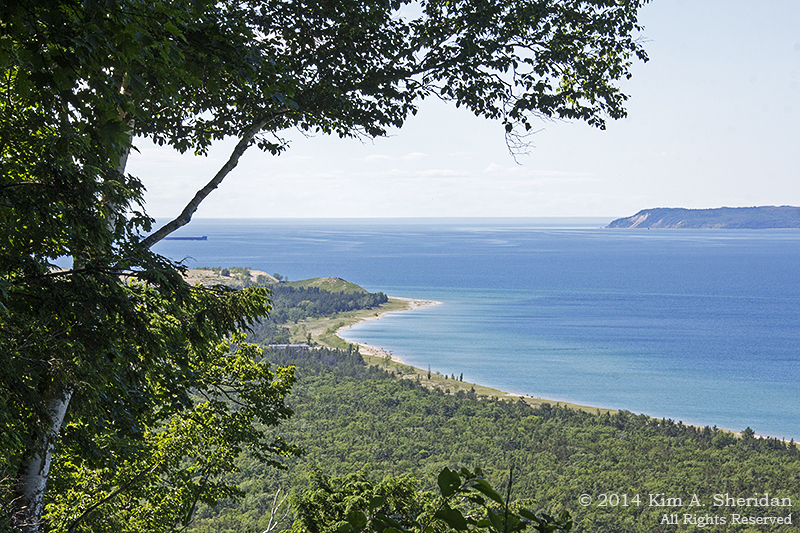 The main attraction Up North is Sleeping Bear Dunes. My first stop was the Platte River, just north of Point Betsie in the southern end of the National Lakeshore. Doesn’t this look like fun? 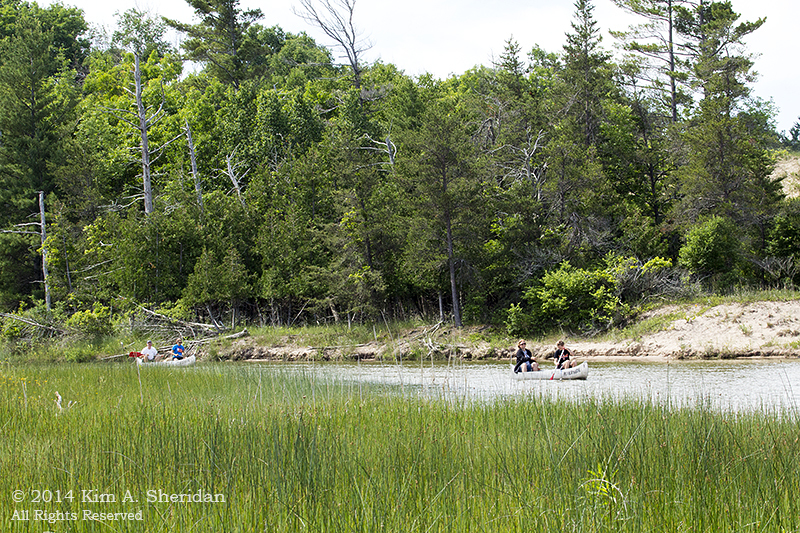 These canoeists are close to the end of their journey, at the mouth of the river where it joins Lake Michigan. There’s a lot of ground to cover Up North, and lots to see. My legs needed stretching after all that driving, and the Alligator Hill Trail fit the bill perfectly. 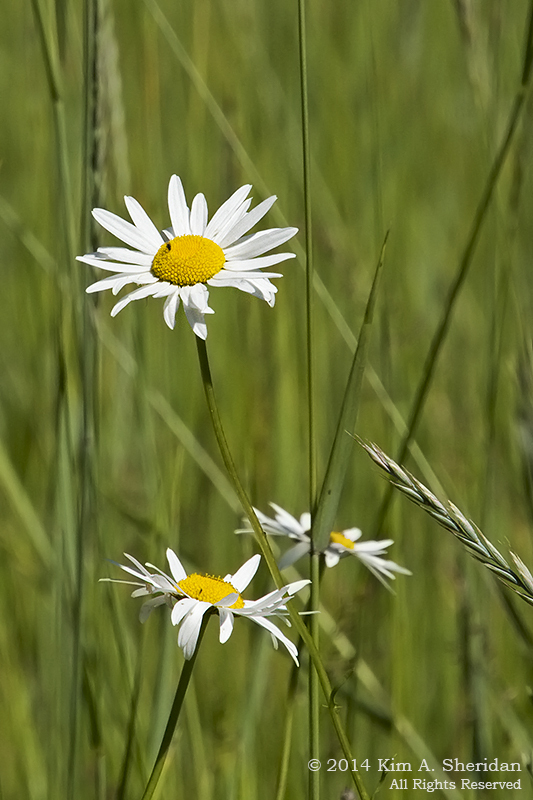 Sunflowers graced the small meadow at the trail head, and small bugs graced the sunflowers. 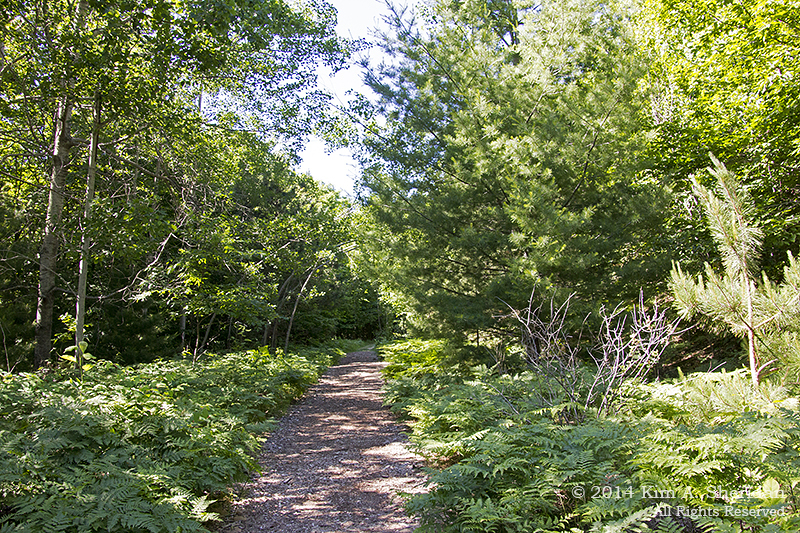 Early on, the trail wound through birches and white pines, underlain with a carpet of ferns. As the path climbed the hill, the forest grew darker and deeper, with beech and maple trees replacing the birches and pines. 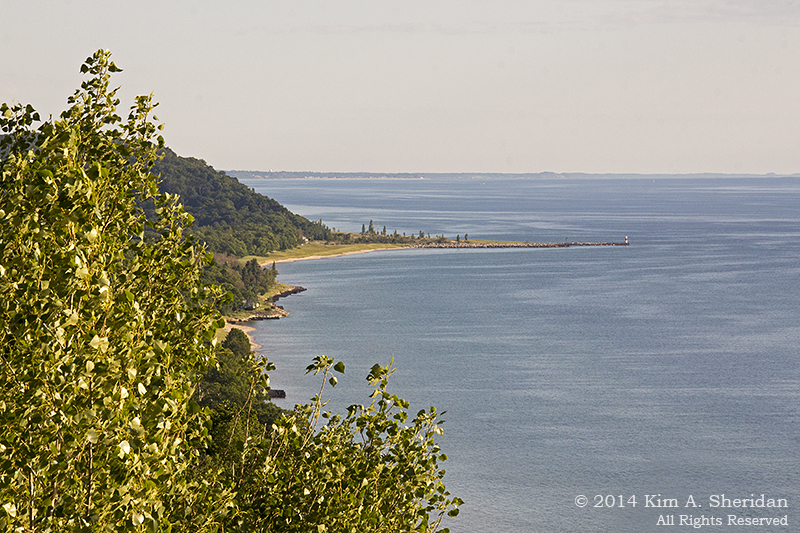 At the top of the hill, the payoff: a stunning view of Lake Michigan. Looking south, with North Manitou Island on the horizon. 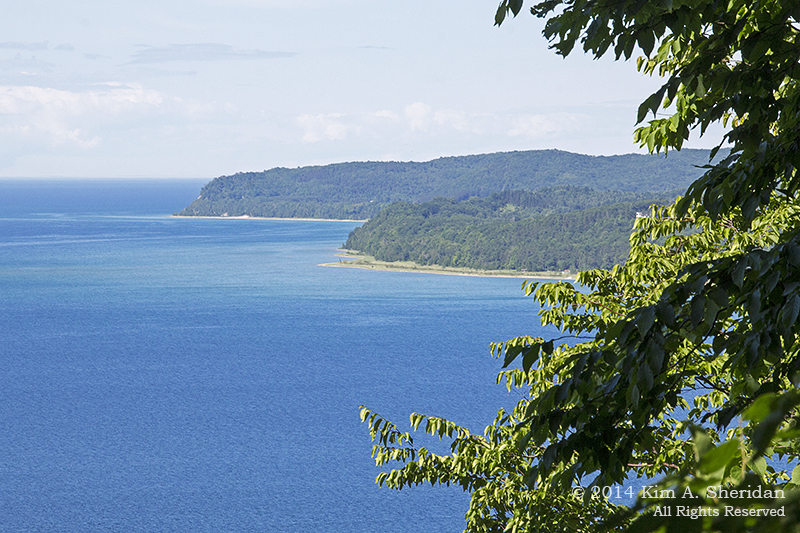 FUN FACT: Lake Michigan is the sixth largest freshwater lake in the world, and the only one of the five Great Lakes that lies entirely within the United States. 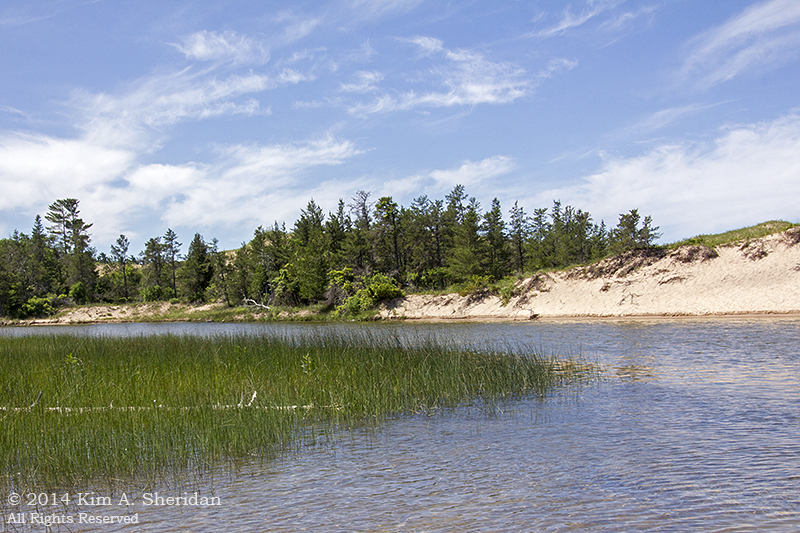 Its freshwater sand dunes, some of which are in Sleeping Bear, are the largest in the world. 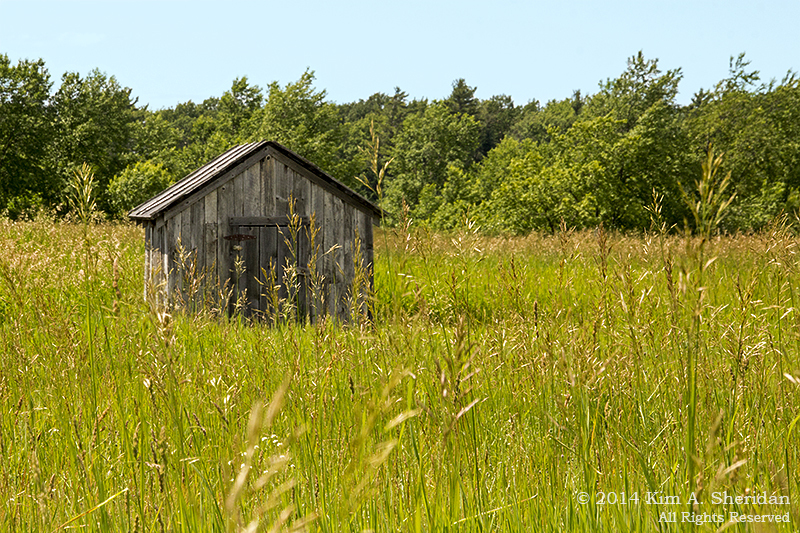 A pastoral scene in the Port Oneida Rural Historic District. With daylight waning, it was time to push on towards home. A roadside sign said “Scenic Overlook”, so I stopped to overlook the scenery. I always do what I’m told. Wow. This is Arcadia Bluff. What a view. There are steps that scale the bluff, with landings every so often for rest and reflection. I climbed every one of those steps, and was glad I did. At the top, I met a man who, having made the trek, was in no hurry to leave. He’d brought a chair and a beverage, and had been perched there for over an hour, happily smoking a cigar, chatting with travelers and watching the sun set. Now that’s the life. Laid back and soaking up the wonders of Michigan. Up North. It’s more than a location; it’s a state of mind. This entry was posted in Music, Nature and tagged Arcadia Bluff, Leland, Michigan, Nature, Sleeping Bear Dunes National Lakeshore by Kim. Bookmark the permalink.